Chalicothere Moropus elatus Skull. Replica. From the mammal browser of the late Eocene-middle Miocene of N. America. Denver MNH. Chalicothere evolved around 40 million years ago from small, forest animals similar to the early horses. Many chalicotheres, including such animals as Moropus and Chalicotherium, reached the size of a horse. By the late Oligocene, they had divided into two groups: one that grazed in open areas and another that was more adapted to woodlands. 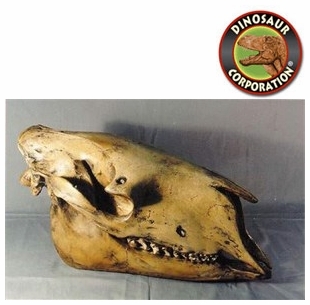 They died out around 3.5 million years ago, and are related to the extinct brontotheres, as well as modern day horses, rhinoceroses, and tapirs.